In California State Superintendent of Education candidate Marshall Tuck’s TV advertisement, he points out that California is 44th in achieving education results. What he leaves unsaid is that this performance parallels our state’s lack of funding for our students. As noted by Dr. Rocio Rivas, “California ranks 43rd in per-pupil spending with an investment of less than $11,000 per student, which is below the national average of approximately $12,526. In addition, California is ranked 48th in class size.” As a comparison, in the 2014–15 school year, New York state spent $20,744 per student. 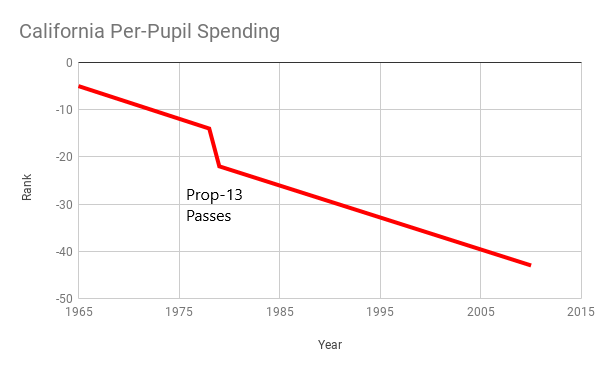 One of the reasons that California schools are not adequately funded is the passage of Proposition 13 in 1978. “Before Prop 13, statewide the schools had a $9 billion budget. After Prop 13 they lost $3 billion — a third of that — overnight.” Instead of elected school board members being able to set property tax rates based on budgetary priorities, they must now rely mostly on state funding. Local priorities are now limited by the amount of funding that is provided by state politicians. For any state politician to improve educational achievement in California, this funding issue, including reforming Prop 13, must be addressed. Unfortunately, Tuck is supported by those who oppose any changes to this proposition. Along with positions that would limit the state’s abilities to pay for infrastructure improvements or allow localities to impose rent control, the Save Proposition 13 Segregated Fund Account has sent out mailing expressing their support for Tuck. Ironically, they list his “plan” to provide “more money to the classroom” as one of the reasons for this support. However, without increasing the revenue stream, this is an impossible task. Tuck was asked about Prop 13 and its effects on education and his inclusion in the Save Proposition 13 Segregated Fund Account mailing. He did not respond.